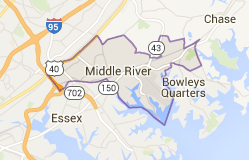 Middle River in Essex Maryland is preparing for a possible new water front development. Manekin, a Columbia Maryland based real estate developer wants to build a community of more than 200 homes. Neighbors are raising concerns about possible overbuilding and the impacts this would cause on existing residents and the environment. The community if approved would be called Water’s Landing at Middle River and would include single-family homes and townhouses. Some of the homes are proposed to have rooftop decks to create stunning water views. According to Baltimore County, the proposed plans are for 207 total homes. Homes would consist of 45 single family detached houses, 56 – 24 feet wide townhouses and 106 – 20 feet wide townhouses. A similar proposal was filed to build the same community with 222 dwellings (52 – single family detached houses, 55 – 24 feet wide townhouses and 115 – 20 feet wide townhouses) and was abandoned in 2010. The Water’s Landing site is zoned to allow more than 200 single-family homes, however, Manekin wants a mix of townhouses and single-family homes. This mix of homes requires approvals for the community to move forward. The developer says they would build walking trails throughout the community and all of the houses would be at least 100 feet away from the shore. This article brought to you by Todd Sachs – Realtor and founder of the SachsGroup.com. The Sachs Group specializes in investor transactions working exclusively in Baltimore County, Maryland. Todd Sachs, Broker of Maryland's Sachs Realty, has been serving the real estate and construction industry since 1989. Currently Positions: -Broker and President of Sachs Realty -President and CEO of Construction Services, Inc -President and CEO of Botanical, Inc For over 25 years, Todd Sachs has developed, designed, built, bought and sold a broad range of real estate. As a Maryland native, Todd grew up in Baltimore County and understands the Maryland real estate industry thoroughly. He is familiar with all aspects of commercial and residential land development, condominium development, residential and commercial flips, industrial and office development and rental properties, both residential and commercial. Todd is a landlord of both commercial and residential properties and is currently developing retail condominiums, building commercial buildings, single family homes and flipping residential properties. Todd Sachs created The Sachs Report as an in-depth look into the Maryland real estate market. Please follow the Sachs Report to stay informed.